Our cousin, Cheryl, who grew up across the street from my grandparents’ house where my brother, John, spent a great deal of time mentioned one day in passing that John was known to be a “stinker” as a child. I’m sure she was not exaggerating. From all the stories I’ve heard, my brother, John was indeed a handful, and not much ever changed. 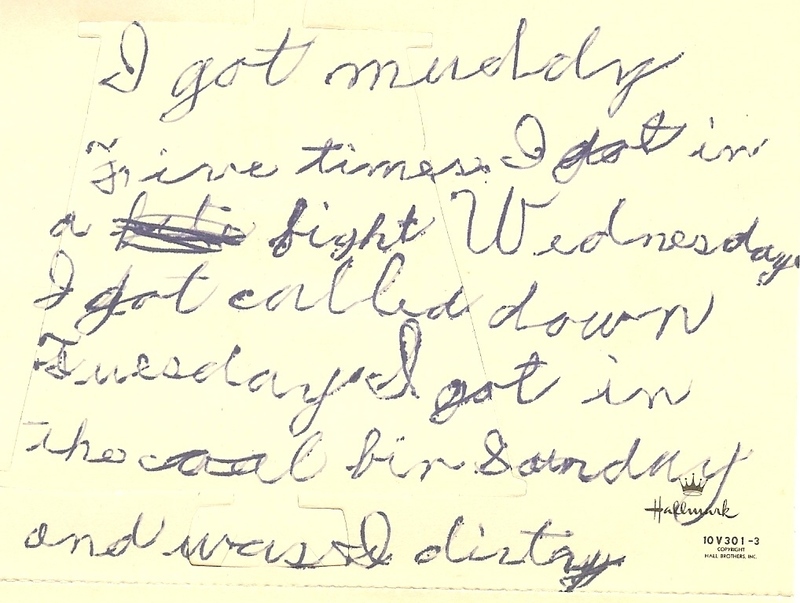 When going through Mother’s things after she departed this Earth, I found something, in John’s own hand, from when he was maybe 7 that proved, beyond a shadow of a doubt, that he indeed fully earned his reputation. John made Mom a Valentine. As all mothers are, I’m sure she was thrilled to receive something from her child. And then she opened it. 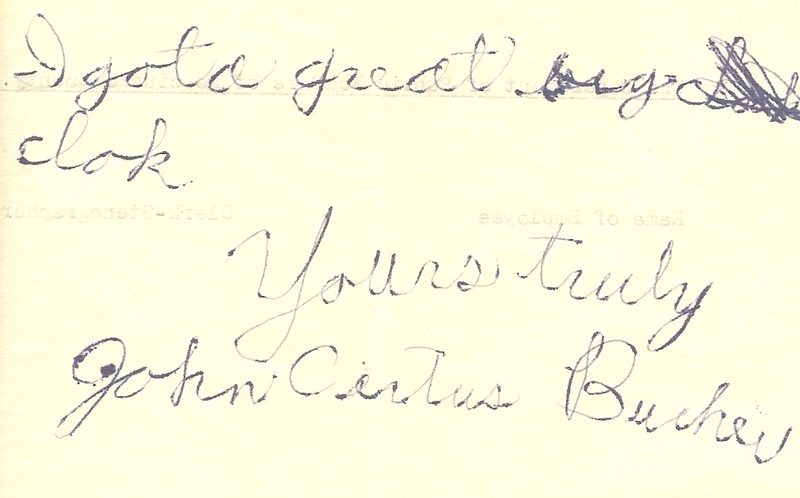 The front is your typical children’s exchange Valentine – and I’m just as sure as I’m sitting here that my grandmother told him to write something to his mother on the back and tell her what he’d been up to…..so he did. I got muddy five times. I got in a fight Wednesday. I got called down Tuesday. I got in the coal bin Sunday and was I dirty. I got a great big clok. Indeed, I’m thinking that every day in John’s life was a new adventure just waiting to happen. This was probably an ordinary week in John’s life. My brother, John, passed away in October of 2012, ornery as ever, staunchly refusing to DNA test as he had for the past decade….asserting that he would rather “not know,” even in death. Actually, what he meant was that wanted to keep me from knowing, just on general principles…just because he could. Personally, I think he did that…or in this case…didn’t…just to irritate me…and he fully succeeded. However, whether I agree or not with his motives or choices, I staunchly defend his right to them. So, for the record, it was NOT me who stole his toothbrush from his hospital room. You see, I knew that toothbrush wouldn’t help at all. I don’t know who used it, took it, or whose it was, but it wasn’t his. This entry was posted in Ethics and tagged 52 Weeks of Ancestors, Examples by Roberta Estes. Bookmark the permalink. Great story, Roberta. Happy Valentine’s Day! Can’t help it ..Just gotta know…unless it’s a secret….Did you pass up the last opportunity to get his DNA? Thanks for the morning smile. Its the second one this morning. I just got a notice this morning from a poss. cousin that she sent her brothers DNA for testing. The note finished with—Rejoice Joyce. Ah some people just know what a good Valentines gift is! Indeed!!! A great Valentine’s Day gift! I can’t stop laughing! What a WONDERFUL depiction of John Curtis and a relationship between a brother and sister that was exasperating at its best! But oh, so typical of so many. And yet I can feel the love you had for him through your words and your sacrifice in order to maintain his dignity. Love you, Roberta. Really great! Happy Valentines Day! Wonderful Family Story. I have been laughing for about 20 mins now, what a HOOT, as we’d say in Texaaaaaz! A lovely story!!! Loved the card, nothing like those older cards of yesteryear. You forgot to mention it was a HALLMARK!! Only the very best! Happy Valentine of Valentine’s Day, Roberta! You are a ‘heart’ to all of us! Wonderful story Roberta! It made me laugh nd it also scared the dickens out of me. I am the Mother of a “John” only his name isn’t John. He is the “one in every crowd”, the squeaky wheel, the kid in the class that usually gets blamed for everything and usually is deserving of that blame; if he wasn’t the one that did “it” he was the one whose idea “it” was. He was taken to the Doctor or Emergency room more than 14 times before he was 13, then I somehow lost count but his escapades have continued. He is close to 40 years old now which is a relief to his Dad and I as we were afraid he’d never make it to 18. GOD BLESS YOUR GRANDMOTHER as it sounds like she may have had the raising of him. The “John’s” of this world have a purpose..if only to give the parents of the rest of the kids reason to be thankful that they all aren’t like “John”. Our “John” has 3 sons and we heaved a big sigh of relief that none of them seem to take after their father in this way. We relaxed too soon as “John’s” sibling has a beautiful little boy who apparently has the “John gene”! That’s fine. What is your blog?